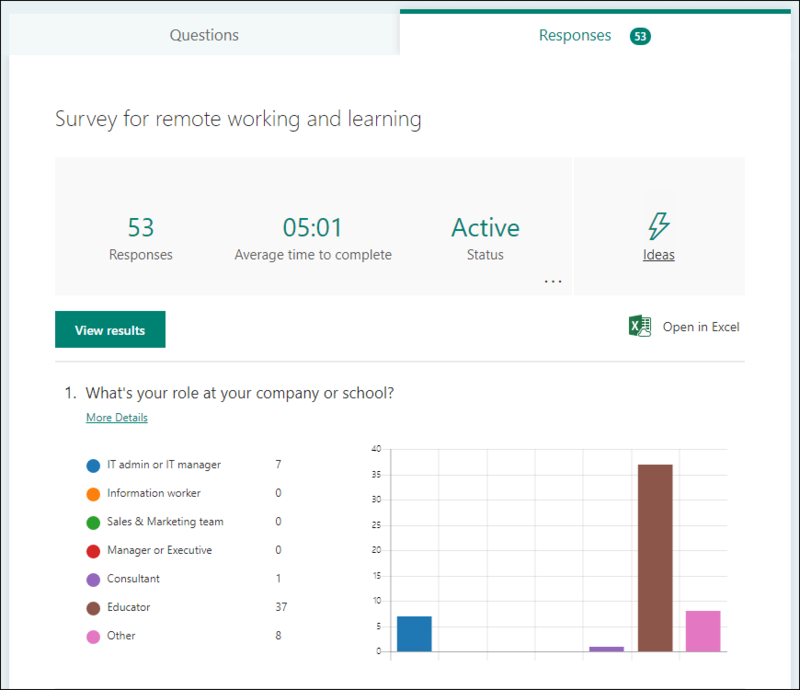 Microsoft Forms includes rich, real-time analytics that provide summary information and individual results for surveys and other types of forms. You can export the results to Microsoft Excel for more in-depth analysis, as well as delete or print a summary of responses. After you create your form, adjust its settings, and share your form with others, it’s time to view the results. In Microsoft Forms, open the form for which you want to review the results, and then click the Responses tab. Across the top, you’ll see summary information data about your form, such as number of responses, average time it took for responders to complete your form, and form’s current status. Next to each question, you’ll see the number of responses and a colorful chart of the breakdown of responses. Click View results to see individual details for each responder, such as time it took to complete your form and the option(s) selected. Click the arrow next to the Responder name to jump to the results of another responder. You can also click the left and right arrows to toggle through the result details of the other responders. Click the ellipses button (...) to delete all responses for a particular individual or print all responses for a particular individual. Learn more about printing forms. You can easily view all of the response data for your quiz or other form in Microsoft Excel. Click Open in Excel on the Responses tab to capture a snapshot of your current response data. If you've created your form in Forms on the Web (https://forms.office.com) and click Open in Excel, an offline Excel workbook will open that has no relationship or connection to your form. If you've created your form in OneDrive for Business and click Open in Excel, your Excel workbook is automatically stored in OneDrive for Business and contains a live data connection to your form. Any new response data in your form will be reflected in your workbook. If you've created your form in Excel Online and click Open in Excel, your Excel workbook is automatically stored in OneDrive for Business and contains a live data connection to your form. Any new response data in your form will be reflected in your workbook. If you're experiencing a download error, please see how to troubleshoot exporting form data to Excel. 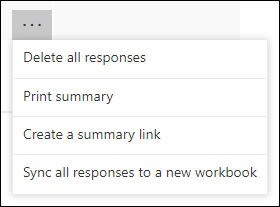 Each question in your form is a column and each response becomes a row in the Excel workbook. The first four columns display the start time and completion times for each response, and the name and email address for each responder. The subsequent columns display that responder's selections. Any changes you make to the form data in Excel won’t modify the content of the response table. Names and email addresses of anonymous students won’t be displayed if you allow your form to accept anonymous responses. Click the Details link to see more details for each question. On the details view, you can see the name of each responder and his or her answers for each question. Tip: Click the column headers to sort the response results.